May 1, 2008 was celebrated as the "World Labor Day" and the "Gujarat Day" with prayers, meditation, and service to the poor & needy. Utsav Triveni at the Ashram concluded with Birthday celebration of Pujya Swami Adhyatmanandaji Maharaj on May 3rd. Daridra Narayan Seva, Bhandara and under privileged children was treated (with gift of note books) on this occasion. Children Camp (May 5, 2009 – May 9, 2009) A residential camp for children was organized on the themes of "Man Making"at the Sivananda Ashram, Ahmedabad from May 5, 2009 - May 9, 2009 . Each day commenced with early morning Prayers, Meditation, Yogasans, Pranayams, & chanting of Vedic hymns. The forenoon session commenced with moral-ethical teachings by Sri Swami Adhyatmanandaji Maharaj, classical music lessons by Dr Monica Shah & her group, painting, craft & art lessons by Miss Ridhi Manna of the Times of India, Ahmedabad. The afternoon classes comprising storytelling & Reiki lessons conducted by the Reiki Grandmaster, Mrs Roopa Majumdar. Evening games were conducted by Ms. Anuja, Mr. Niraj Bhardwaj and Shri Nitin. As always, Pujya Sri Swami Adhyatmanandaji Maharaj's presence brought a special fervor, He was present most of the days. This was followed by the evening meditation & after dinner satsang. On the evening of May 9, 2009, a grand valedictory function was held, which was attended by the parents. All the children were bubbling up with joy. They presented a small show, classical music & demonstrated yogasans, which they had learnt during the preceding five days. Smt. Dr. Monika Shah awarded the certificates of the camp issued by Sri Divya Jivan Sanskrutik Sangh, Sivananda Ashram, Ahmedabad. May 8th happened to be a world Thelesemia day. Rev. Swami Adhyatmanandaji Maharaj was invited to inaugurate a new blood collection van of Prathama Blood bank. Mr.Ravi Saxena (IAS), presided over the function. Sri Swamiji gave an inspiring discourse and appeal all to support the Life giving blood donation drive. 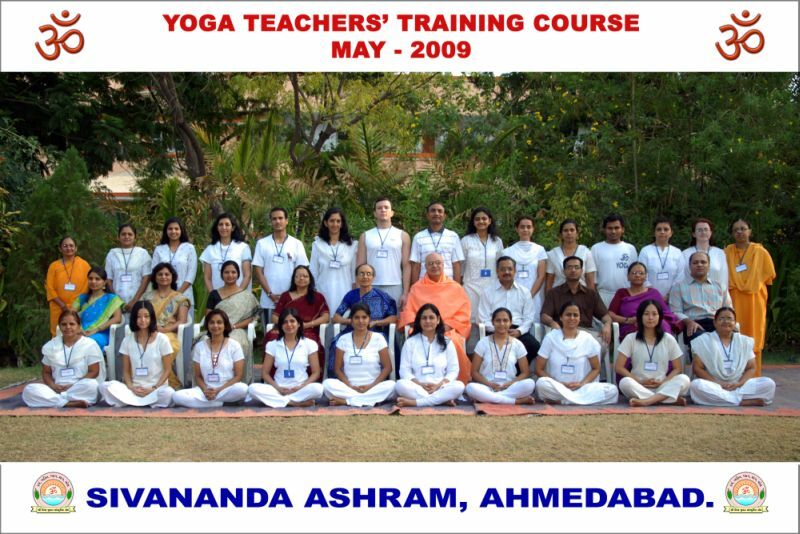 18th (YTTC) Yoga Teachers Training Course ( May 11, 2009 - May 30, 2009) Twenty three advanced Yoga students attended and successfully completed YTTC, which was held through "SIVA Yoga Center" at Sivananda Ashram, Ahmedabad, under the guidance and leadership of Sri Swami Adhyatmanandji. The students from all over India, Brazil & Japan attended the course. Our team of Yoga Teachers including Sri Swami Adhyatmanandaji Maharaj, Dr. Varsha Dave (Gynecologist), Dr. Bharat Trivedi (Dean, VS Medical College), Dr. Amish Kshatriya (Orthopedic Surgeon), Dr. Vishal (Diabetologist), Dr. Ira Patel (Pathologist), Mrs Chiidrupini Kshatriya (Dietician), Smt Roopa Majumdar (Reiki Master), Ms. Sangeeta Thawani (Yoga teacher) conducted the classes during the course. Award presentation ceremony to the YTTC students by Smt. Anandiben Patel( Minister of Revenue, Govt.of Gujarat) on May 29, 2009. 18th YTTC was concluded on May 30th evening. Ms. Dr. Aarati Bhupeshbhai Thakkar was the First student and Mrs. Seema Nikhil Trivedi was the outstanding student. A special gift presented to both of them. The 726th Yogasana, Pranayama, and Meditation Camp (May 11, 2009 - May 20, 2009) On 11th early dawn 726th Meditation, Pranayam and Yoga camp was commenced in the worthy presence of Mr. Ravi Saxena (secretary for health & family welfare,Govt. of Gujarat) and a very well-known cancer Surgeon Dr. Bharat Dave. Seven hundred candidates joined the camp. On May 29, 2009 afternoon, Trustees meeting, Board of Management meeting and annual General Body meeting was held at the ashram. At Nareshwar - at holy ashram of Sage Sri Sri Sri Rang Avadhootji Maharaj, Sri RangYouth activity group organized Youth camp on May 23 rd & May 24th. Two hundred & sixty five youth attended this two days camp on the theme of "Man Maiking", group discussion, individual talents, elocution competition, Mantra Chanting and cultural exposition activities held during the camp.Sri Swami Adhyatmanandaji was invited as a special guest. Sri Swamiji inspired them. Prize and awards were presented to the winner of the program. On May 14th also Swamiji visited Nareshwar. But it was for a solemn occasion of last rites of most pious soul and ardent devotee of Sivananda family, Sri Bhikhubhai Desai, who departed peacefully at age 94 years. His ashes were dispersed in holy Narmada river after last worship performed in presence of Pujya Swamiji Maharaj. The family members felt solace & peace with Swamiji's presence. They expressed their gratitude to Revered Swamiji. On May 18, 2009 evening Sri Swamiji presided over the Arangetram of Ms. Mazumdar at famous Tagore Hall. After award presentation Sri Swamiji, in his valedictory speech shared the thoughts that Bharat Natyam is a dance of great discipline. It helps to bring harmony between mind, body and soul. It leads to divinity. Seven years of training is not enough. Now is the begining and you are becoming fit to enter in the kingdom of vast educational ocean of learning. On May 19th & 21st Sri Swami Adhyatmanandaji visited Mumbai. During his stay he visited Sri Prempuri Ashram and graced number of devotee's house upon their request. Sri Hemant Sanghviji was the host for Sri Swamiji’s visit to Mumbai. 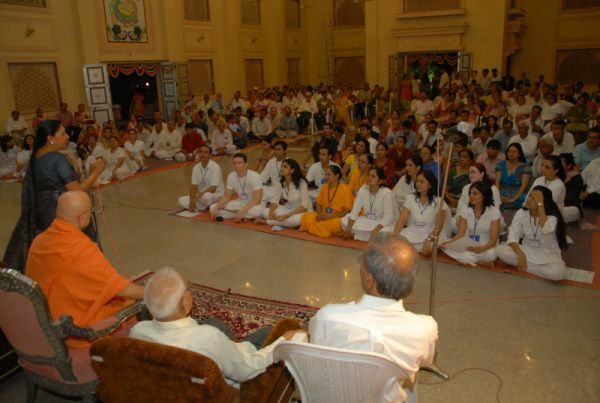 On May 29th, 2009 a special gathering was organized for Pujya Sri Swami Adhyatmanandaji Maharaj at the start of His "Divya Tour 2009 " to the west. Devotees wished him a joyful, peaceful, meaningful tour to UK, USA & Canada, Scotland and Germany.